Back in mid-October, one of our long-time MySpace friends, Dell contacted us. 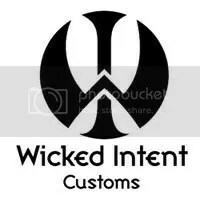 He has a custom art shop under the name of Wicked Intent in Santa Rosa, California. 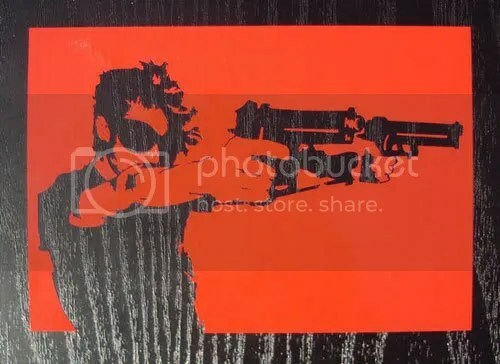 They specialize in custom guitars, custom painting existing guitars, refurbishing old guitars but what we’re concerned about here is custom vinyl graphics. He thought some of my artwork would translate well into vinyl which happens to be one of the mediums that he excels at. If you head on over to his MySpace page and take a look through his galleries you’ll see he’s quite accomplished with that craft and many others. 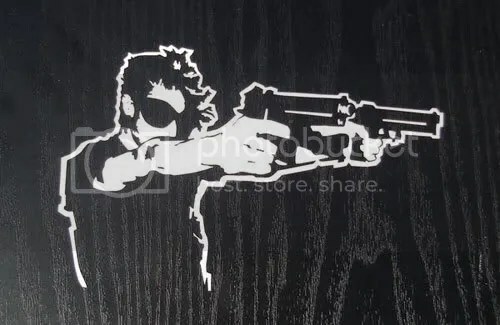 The process for vinyls around here is to first find or make an image you like. 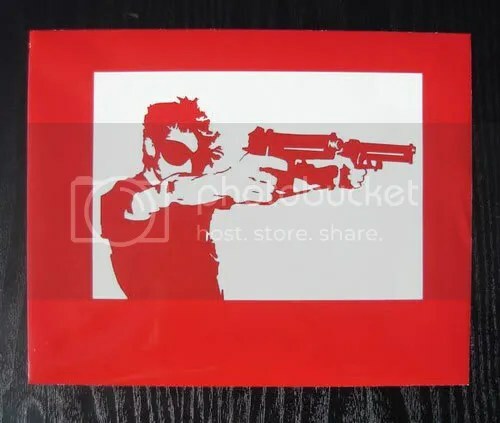 You then need to make sure that the image is “vinyl friendly”. Vinyl is very versatile but does have its limits. Too much detail in the image and they are almost always difficult to work with. Most vinyl machines simply work as a plotter. 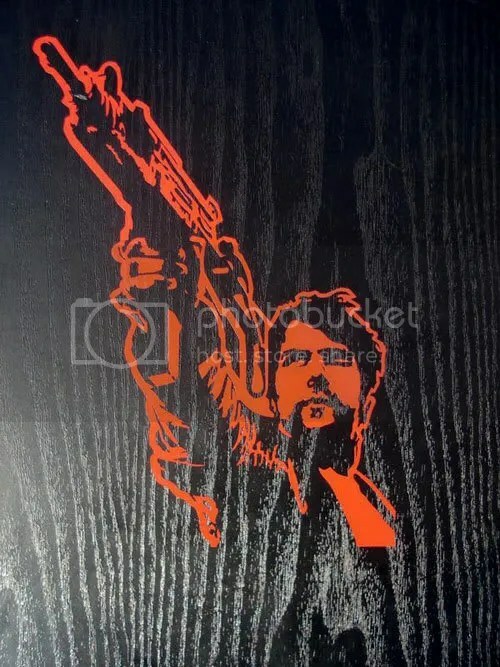 The razor plops down and cuts the outline of the image into the vinyl. Some are more fancy, but I am not that lucky. 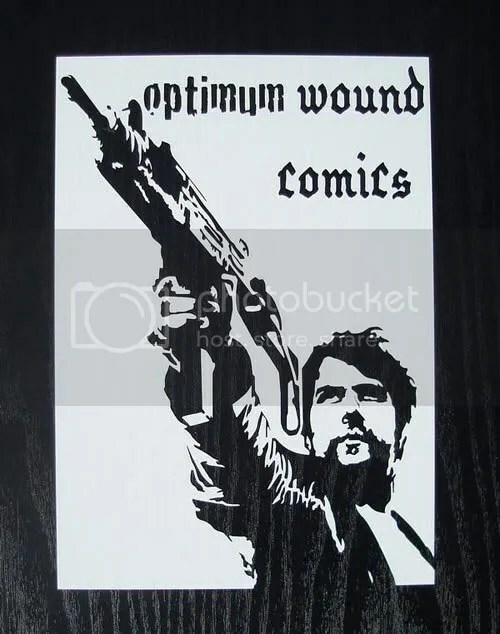 In the case of the Optimum Wound images, the issue was trying to keep as much detail as possible as to not lose the reflection of the original work. It needs to look like the original image after all. Once the image is revised enough, its off to the cutter for a test. The only way to know if it will work is to cut it out. Next, one has to peel away the unwanted sections of vinyl to reveal the image. This is why massed produced vinyls tend to not be very detailed. Too much detail is hard to work around with removing extra material. I do not mass produce. I am therefore willing to take a little extra time to work with the material removal. During this process, an exacto knife will be your best friend. Its great for lifting corners and holding down small sections you want that are surrounded by material you don’t. Once the image is done its time to put on the application paper. This allows you to remove the vinyl sticker from its backing and apply it cleanly to the surface you are working with. Next, clean up the edges in a paper cutter so it looks all neat and pretty and off they go to whoever wanted it in the first place. It’s a good to have talented friends. Here are five pictures of Dell’s creations followed by 2 of the pen and ink pieces that he based them on.